Enriched with moisturizing ingredients (Aloe-vera* and hyaluronic acid) this soft and light textured fluid leaves the skin clear and radiant. 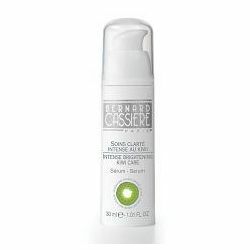 Enriched with moisturizing ingredients (Aloe-vera* and hyaluronic acid) this soft and light textured fluid leaves the skin clear and radiant. It contains a Pomegranate extract, rich in vitamins and minerals, and famous for its purifying and softening properties. A complex of AHA superfruits (Cassis - Bilberry) has been added to improve skin elasticity, restore radiance, smooth superficial imperfections and reduce the appearance of wrinkles and age spots. Apply morning and/ or evening on a perfectly cleansed skin.